One of the extraordinary aspects of hail is how one vineyard can be badly hit, while another just a few hundred metres away looks as if nothing untoward has happened. It isn’t entirely random, however. The storm will follow a certain route and anything in its path is at risk, while vines either side can remain unscathed. 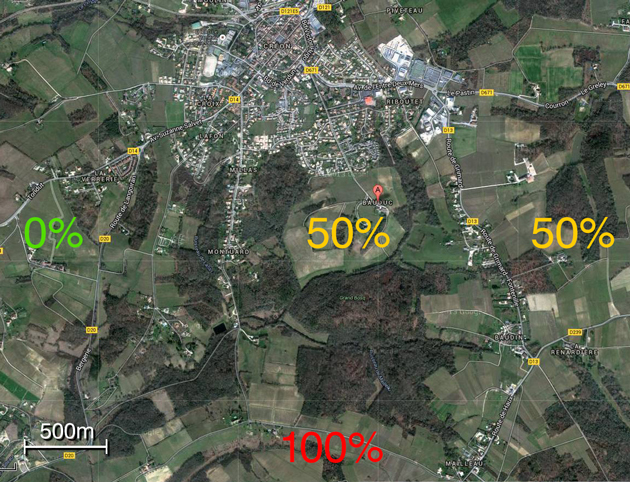 Chateau Bauduc is in the centre of the image above, where a little red A marks the spot. Our vines surround the Chateau and winery – a single vineyard with woodland on three sides and the town on the northern boundary. To give you an idea of the scale, the estate covers 75 hectares, a third of which is planted with vines. We lost around 50% of this year’s harvest in the storm on 2 August 2013 due to hail damage to leaves and grapes. It could get worse here if rot sets in now or later, or if the remaining grapes don’t ripen. We can only wait and see. Here’s the thing, as the map shows. Vineyards just 2kms to the west of us were untouched because the storm passed by to the south. Yet on the other side of our woods on our southern boundary, about 2kms from our house (I can see the vineyards as I type) the vines were stripped bare by the hail. That’s 100% loss for this year, after all the work in the vineyard which began all the way back in November. The contrast is fascinating, and worth a detour in the next month or two if you’re into wine, or thinking of buying a vineyard. On the road into Créon from Bordeaux via Camblanes, there’s no hail damage. On the road south of our woods, called Le Chemin de la Besine (you’ll find it on google maps), near the hamlet of Mailleau, there are no leaves left at all. That’s where the 100% (loss) is marked. The pictures below were all taken within 2.5kms of us, south and south west of Créon. Some of the worst hit vines, marked 100% on the map, are in the commune of Haux. These vines are actually in the Côtes de Bordeaux, as our border sits between the appellations of Bordeaux Supérieur and the Côtes de Bordeaux. Note the position, in many pictures, of the pale blue water tower, which is Créon itself. It just shows how close the vineyards are to each other. Some lost out, some scraped through. With this gallery of photos, scroll over any pic for a brief description and click on it for a larger image. You can then flick through them (in a normal browser) using the < & > arrows. To return to the post, click the X on the top left. Marked on the map, 100% loss. Speaking to a number of farmer friends over here you have their total sympathy – a year of work wiped out in seconds!! Thank you for the link and the kind words, Stuart.